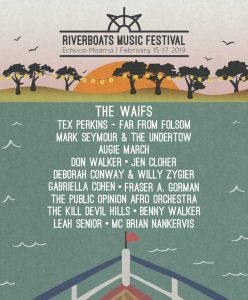 Staged in the twin-towns of Echuca-Moama on the third weekend in February each year, Riverboats takes place under towering river red gums in a natural amphitheatre next to the mighty Murray. Historic paddlesteamers meander past all weekend, and occasionally the corellas get a bit raucous at sunset. We have one stage and plenty of room for dancing, brilliant artists and some of the best food trucks going round. In 2019 the Riverboats Music Festival will celebrate its eighth anniversary from Friday, February 15 to Sunday, February 17, and we’d love you to join us. It will take you just two and a half hours to get to Echuca-Moama from Melbourne, and there are plenty of great places to stay when you get here. Come and join us for a weekend on the river.